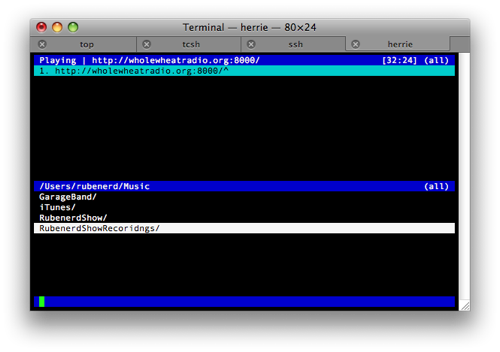 A quick addendum to my previous post talking about using Herrie to listen to Whole Wheat Radio. It turns out Herrie only supports playback of the Hi-Fi audio stream; if you attempt to download and run playlists for the Lo-Fi or Med-Fi streams you'll be given a "Sample rate or number of channels not supported" error. Sorry about that! I've updated the Herrie page on the wiki to reflect this. For what it's worth, Herrie is still an excellent, low resource using audio player.